If you don’t completely understand what makes up the Internet of Things, you can’t adequately protect your business from the challenging new security vulnerabilities it might bring along with it. Thankfully, you don’t have to go this path alone. Blue Jean Networks is here to help ease your transition into a new age of technology. More devices mean more network access points. However, the main problem with network security in the age of the IoT might be the result of so many devices connecting to the Internet; namely, your business’s network. Will it be ready to deal with more connected devices? Have you taken measures to protect your network from unauthorized access from devices? Blue Jean Networks can equip your business with our Unified Threat Management device, which is designed to protect your network from a variety of threats and vulnerabilities. Blue Jean Networks’ mobile device management solution can help your business discern the good applications from the bad. We can also limit which applications have access to sensitive or confidential data, which might be found on personal or work devices. It’s an ideal solution to augment your current BYOD policy, if you have one in place. 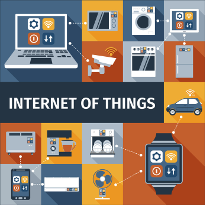 For more information about how Blue Jean Networks can help your business prepare for the Internet of Things, give us a call at 817-231-0222. We can assess your network security and BYOD policies, and provide consultation for how to move forward.